Support for Kari - Here and Abroad! How awesome to open my email this morning and see this email and photo....from France! She saw the 48 Hours episode about Kari's murder and was so disturbed that she couldn't even sleep that night. She was convinced that Kari didn't take her own life and wanted to do something....anything....to help and/or show her support. 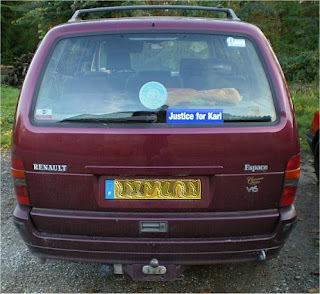 So she now proudly has her Justice for Kari bumper sticker as she drives around France. I don't think I've shared this on the blog before but you might find it as fascinating as I do. This blog has many visitors from overseas. At a quick lookback, I can see: Columbia, Canada, United Kingdom, Germany, Norway, Hong Kong, New Zealand, Austria, Japan........and that's just for starters. And these are not bots or spiders or accidental visits. They are visitors using "pertinent search words" for this case. People from ALL OVER Waco, Kerrville, the State of Texas, across the U.S and the world are tuned in to wait, pray and at the perfect time watch justice unfold in McLennan County. And on behalf of all those who love Kari and her girls, I'd like to say "Thank You" and "God bless you" for all your prayers and support. Been really busy lately. However, Kari’s family is always on my mind and heart. Didn’t see it but I heard that Channel 25 ran a short news blip last week about….. not really sure what it was about actually…. Is Matt Baker’s new attorney counter-suing the Dulins for defamation of character? What is the new attorney’s name? Richard Ellison? No other station ran the story and it only ran once, from what I heard. Kind of odd, if you ask me. Hmmm…Mr. Baker, all that public notoriety you have been seeking may not be good for a defamation case. Just sayin'. And then, there is the truth….. you know.....again, just sayin'. Under the First Amendment of the United States Constitution, as set forth by the U.S. Supreme Court in the 1964 Case, New York Times v Sullivan, where a public figure attempts to bring an action for defamation, the public figure must prove an additional element: That the statement was made with "actual malice." In translation, that means that the person making the statement knew the statement to be false, or issued the statement with reckless disregard as to its truth. For example, Ariel Sharon sued Time Magazine over allegations of his conduct relating to the massacres at the Sabra and Shatila refugee camps. Although the jury concluded that the Time story included false allegations, they found that Time had not acted with "actual malice" and did not award any damages. The concept of the "public figure" is broader than celebrities and politicians. A person can become an "involuntary public figure" as the result of publicity, even though that person did not want or invite the public attention. For example, people accused of high profile crimes may be unable to pursue actions for defamation…… on the basis that the notoriety associated with the case and the accusations against them turned them into involuntary public figures. Yep, still here. Sometimes life gets in the way but I am still here. I am going to be here for the long haul supporting Kari’s family. Supporting my son’s teacher. The long haul. And I am far, far, far from being alone in this.